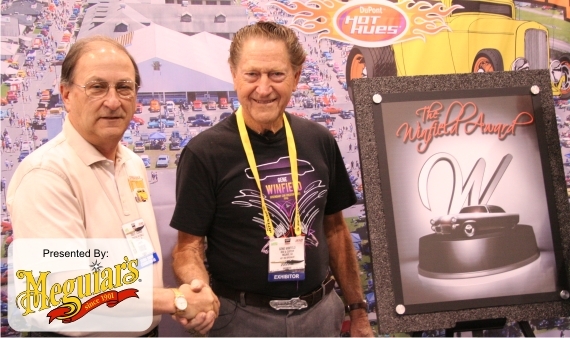 One car owner at this years 2019 Syracuse Nationals will be the recipient of the 10th Annual Winfield Award. The prestigious award for automotive excellence will be presented by master car customizer and builder Gene Winfield. The winner will receive a beautiful custom trophy, jacket and $10,000. The remaining 5 will each receive a custom trophy, jacket and $1,000. All entries must be mailed to Right Coast Inc.
beautiful trophy and a $10,000 check from Meguiar’s. The winner of the 2018 Winfield Select Six award, at the 2018 PPG Syracuse Nationals, is a 1956 Continental Mark II, owned by Chris Ryan, of Ninety Six, SC. The original car is a spectacular exercise in design that was a two-year project by the Ford Motor Co., but Chris Ryan, improved upon the original to an extent that it was selected the winner among a group of six magnificent cars competing for the prestigious Winfield Award, and $10,000, courtesy of Meguiar’s Car Care Products. Chris, owner of Ryan’s Rod & Kustom, in Ninety Six, said he built the car the way legendary car designer and builder Gene Winfield, might have. Indeed, Winfield, of Mojave, CA., was on hand to judge the six cars, and present Chris a custom-made trophy, plus the check for $10,000. Besides that, he earned bragging rights as the winner of the award. During the weekend Gene said one of the elements he likes to see when judging cars is how much work the owner did. In this case, Chris Ryan did it all. “I am honored to receive this award and be recognized for the work we did,” Chris said. Chris said when he designed the car he imagined it the way Gene Winfield might have built it decades ago. To that end Chris sourced parts from old cars, just as Gene might have. For example, the steering wheel is from a 1961 Plymouth. If you’re old enough you’ll recall the wheel was squared off on two sides. The instrument cluster, centered and low on the dashboard, is from a 1960 Chrysler letter car. It’s called the Astrodome Cluster. The bucket seats are from a 1964 Thunderbird. And did you check out the wheels and wide whitewalls? Notice anything? The wheels look like 15-inch, right? Well, the wheels are actually 20-inch. The chromed center area is 15 inches and the wide whites, 2.5 inches, are actually the wheel that’s been painted an off-white shade. Because they’re so wide, and to give them some dimension, there are raised diamonds on the sidewalls. The whole deal was done because wheels back in the day would have been 15 inch. Each wheel, by the way, began as a solid block of aluminum. Chris said he thought about a car like this for a long time and occasionally checked prices of used Continentals. Remember, there weren’t many to begin with, so those that did survive are usually priced in six figures. He found this one, in sad shape, nevertheless at a shockingly low price. Forget the condition, he bought it because he knew the car was going to be reshaped anyway. “I had to keep my shop going and money coming in, so we had to get this car done quickly,” he said. The project was 10 months from start to finish, an amazing compressed time when you consider the extent of the work. When Chris saw the Continental, he wasn’t fazed even though it was missing parts and had no interior. The car was owned by the late actress and singer Susan Hayward, who died in 1973. She had retired near Atlanta, and the car was still there in the hands of a man who repaired and sold trucks. If it seems like Chris is a bit of a gambler, it’s because he is. He’s a mechanical engineer by profession, but once he got into it he began to have doubts. Basically, it wasn’t what he wanted to do. So, he shifted gears, no pun intended, and started building cars; not any cars, mind you, but special cars, such as the Scarlet Lady, that swept the field at the 2018 PPG Syracuse Nationals. Being in the business, he knew that most people want to do custom work to Corvettes, Camaros, Mustangs, cars like that, but not the real high-end stuff. So, he has to look for the discerning customer, the person who wants something special. One of his first builds, a Fat Caddy, in 2001, went on the road with him to every car show he could find. “I did everything I could to show off the car,’ he said, in other words, show off the work he could do. The effort paid off because he developed a working relationship with PPG, the title sponsor of the PPG Syracuse Nationals, and a company that knows a thing or two about auto finishes. “I hooked up with PPG and they took us under their wing and helped us along,” he said. “We’ve aligned ourselves with great companies and it’s paid off,” he said. Gene is a master of his craft, and world famous for his custom cars and hot rods. A recipient of the 2001 NHRA Lifetime Achievement Award, he has over 60 years experience in custom hot rod fabrication, land speed, and oval track racing. Winfield is one of the key players who started the customizing craze that first swept through California and then throughout the nation in the '50s and '60s. Gene's cars have appeared in more than 25 motion pictures. Winfield's best known custom car, the "Jade Idol," started as a '56 Mercury. The "Jade Idol" positioned Winfield at the leading edge of auto exotica. This car took two years to build and received top sweepstakes awards at national car shows for the next several years. Entrants must have at least one radical modification. (e.g. chopped, sectioned, and/or channeled) Entries must be 1937 and newer. From the entries, Gene will nominate 6 vehicles to be known as the “Select Six”. The Six will be on display indoors all weekend at the Syracuse Nationals, July 19, 20, 21 2019. The Winfield Award winner will be announced Saturday evening, July 20th during the Awards Banquet. The winner will receive a beautiful custom trophy, jacket and $10,000. The remaining 5 will each receive a custom trophy, jacket and $1,000. For more details and criteria call 800-753-3978, Mon. - Fri. 9am to 5pm EST.